Raining On The Nuclear Parade : Blog Of The Nation Police and TV cameras converge on the marching nuclear warheads that approached the president's nuclear security summit in Washington, D.C. The security picture I painted yesterday outside of the international nuclear security summit is still accurate today. But the streets outside of NPR turned a bit more colorful today -- if only briefly. A small -- but clearly crafty -- group of protesters marched down K Street toward the Washington Convention Center, carrying a no nukes flag and dressed from head to toe as nuclear warheads. 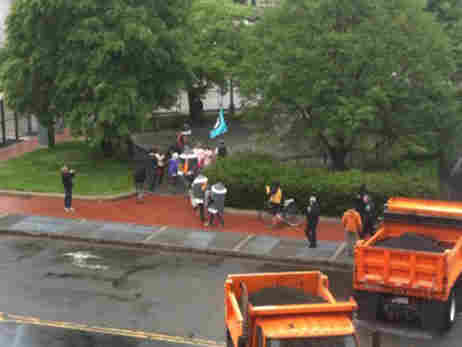 Sadly, the D.C. weather didn't cooperate with their mini-march, and those cardboard nukes got a bit soggy. That didn't appear to douse interest in the walking, talking warheads, though. At one point, police officers outnumbered the protesters, and television news cameras descended on the marchers for what I assume from this vantage point were interviews.